Dadu: 235 FIRs registered and 50,400 people booked. Naushahro Feroze: 151 FIRs registered 51,323 people booked. 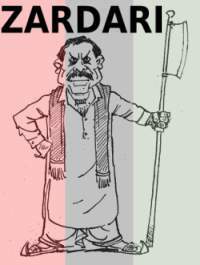 With Sunday’s decision by the Pakistan People’s Party to contest the elections, it instantly threw the PML-Q and the ruling elite into a frenzy, the PML-Q had predicted this move and a day before had announced a complete stoppage of their election camping taking the excuse of deteriorating unrest in the country following the assassination of Benazir Bhutto. Generally numbers and figures don’t catch the eye unless one notices a startling discrepancy between a few survey. It has been on record that the International Republican Institute, a world renowned organization carried out a five-part survey over the past year which continued to show a decline in Musharraf’s popularity from a massive 65% in Sept 06 which took a nose dive over the 2007 year to land at a measly 22%. Comparing both IPOP and IRI surveys one does instantly notice 20% difference. In the popularity graph when comparing various leaders in Pakistan the survey showed that Nawaz Shairf poised at 53% popularity, Benazir Bhutto at 36% and Musharraf and Imran Khan at 22% and 21% respectively. To bring: banners and placards. Call by: LAWYERS, STUDENTS, Imran Khan and Qazi Hussain will be there in solidarity. To bring: Candles, flowers, banners and placards. Why Boycott is not an Option? In the outrage post emergency, I was confused about whether the opposition should boycott the elections or not? For instance, soon after emergency, when a Lahore based journalist (and one for whom I have high regard for), currently in Karachi, was emotionally advocating oppositions’ boycott of the polls, my only response was, I am not sure whether boycott is a good option or not. As the outrage is giving way to rational, I am getting more and more convinced that boycott is not the best option. Before I build my case, let me clarify one thing. Just when I believe that boycott of 1985 elections by MRD was not the right decision; I am not ready to buy the argument that had MRD contested those elections, under Zia and his apparatus, it would have won them. However, what contesting would have done then was, make life a lot more miserable for Zia and let democratic forces have more bargaining power against Zia. And I don’t expect miracles happening in 2008 either. Then why am I advocating opposition contesting elections? Coming through a number of sources, the PTI leadership is said to have refused to file election papers for the upcoming elections on the grounds that it is a farce and far from being fair and independent being orchestrated by a Martial Law administrator simply to enable him to get a life extension from the west for his much acclaimed ‘positive steps towards democracy’, sadly the world stands witness to the numerous human rights violations that have been conducted to see through this farce. I am told PTI has taken this initiative as it passionately felt the need to pressure for change and stand shoulder to shoulder for an independent judiciary, it must be noted that other APDM parties may already be in the process to submit their nominations surely to play it safe and defer the decision for a few more days but PTI has in turn taken a very bold position. Opposing General Pervez Musharraf is not a cause worth endorsing solely by itself. General Pervez Musharraf is not the man he was when he first usurped the seat of Pakistan’s government. Over time as his political age has advanced, he has undergone a staged metamorphosis: from an amateur idealist, to a practitioner of temperate Realpolitik, and then finally to an outright Machiavellian Prince. It will be profoundly self-righteous of any single one of us to contend with authority that if exposed to the General’s temptations – the troika of International interests, institutional weaknesses and a manipulatable judiciary – we ourselves would not succumb to a similar fate. Opposing General Pervez Musharraf is therefore akin to focussing on the proverbial symptoms of a malady, and not its root, when in fact ours should be a struggle against the method of perpetuation of our affliction and not its recurring product. We are merely opposing a masque today. It is high time that we question our motives before treading any further with placards in hand and slogans on tongue. The return to democracy we yearn for today can potentially be a rude awakening since General Pervez Musharraf’s successor in the wake of an all-pardoning National Reconciliation is set to be Ms. Benazir Bhutto. Notwithstanding those forgotten corruption charges of fraudulently amassing roughly $1.5B of the nation’s wealth, she is a more vociferous representation of strategic international interests than the General; she is the proverbial soldier of fortune. APDM in full unity has resolved to boycott this sham elections. On a number of grounds of which was the restoration of judiciary to the pre Nov 3rd status was very much highlighted. 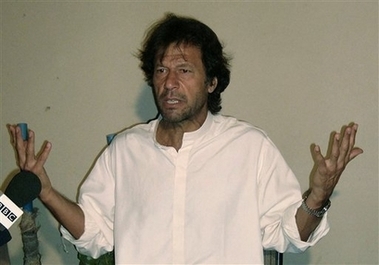 The insistence of boycotting the elections was strongly tabled by Imran Khan as he felt that the opposition should boycott to expose the sham elections. I am told that JUI (Jamiat-e-Ulema-e-Islam) did not attend the meeting and hence it could be speculated that they will contest the elections. I believe this decision should be applauded as the spam election would only go to approve the circus created by Musharraf and his reeling and dealing with Benazir Bhutto and the crooks all combined into one. Musharraf announced the elections as if to challenge the opposition to fall for this trap and in effect validate his attempt to present the world with an electoral process. I hail this decision as it can indeed be the start of a struggle to resist the rule by Musharraf, a larger combined opposition sitting outside will maintain an ongoing pressure on the bureaucracy even if they go through this sham elections. 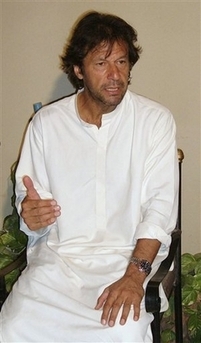 I have just been informed that the Central Executive Committee of the Pakistan Tehreek-e-Insaf in a meeting today in Islamabad has insisted with Imran Khan despite his commitment to the cause of restoration of Judiciary in Pakistan to break his five day long hunger strike in which he had also stopped taking in water. They felt that his adopted measure of doing a hunger strike was influential while he was in prison simply leveraging the only tool he had available, his body. Once free the entire Pakistan Tehreek-e-Insaf has promsed to continue its struggle for the restoration of Judiciary in Pakistan. Supreme Court Justice (Retd) Wajeehuddin Ahmed has strongly supported the hunger strike of Mr Imran Khan for the restoration of the judiciary. In a discussion with Dr Arif Alvi the Vice President of Pakistan Tehreek-e-Insaf he said that the hunger strike is a most significant part of the noble struggle being waged by the nation. He appealed to the Pakistani people to bring about a change and put pressure on the establishment to mend their ways and return to the pre-PCO status. He said that restoration of the judiciary is much more important than the sham election or the issue of the Presidential uniform. There can be no change until Musharraf resigns and the constitution is followed in letter and spirit to herald a caretaker government of consensus to hold elections within 90 days. Everything being done now is a sham. 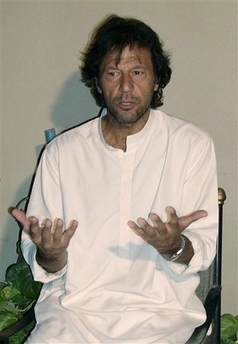 He said that the struggle of Mr Imran Khan should show the light to the youth who can take Pakistan out of this mess. He appealed to the international community and the local and international legal fraternity recognize Mr Imran Khan’s struggle and to put pressure on the Musharraf regime to see the writing on the wall.